Celebrate Saint James Day 2014 in Ireland at the first ever CaminoWays.com Walking Festival. St James Day (25th July) is the most special date of the year on the Camino de Santiago and the biggest festival in Santiago de Compostela and Galicia. As you know, the city and famous walking trail takes the name after St James (the remains of St James are said to be buried in Santiago’s magnificent cathedral). We are inviting Camino de Santiago fans, walking enthusiasts and families in Ireland to celebrate St James with us on Sunday 27th July. *Please note booking is now closed (Friday 25th July, 12pm). 3 walking trails to choose from: long (14km), easy (4km) or a Leave No Trace scavenger hunt for families with children (4km). Jaime from FoodFiesta.ie will be cooking his famous giant paella for the walkers. 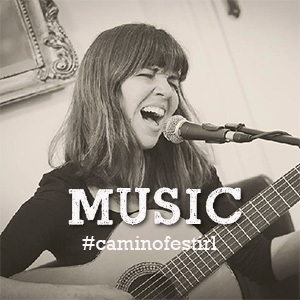 We’ll also have live music from talented Galician singer Susana Garrido. Survivalist Ireland will have live bush craft demonstrations, while D-Pete Health and Fitness will be able to give you fitness and preparation advice. 53 Degrees North will have their gear specialists on site to give you equipment tips and they will also have a fantastic draw giving you a chance to win a €150 voucher. All the CaminoWays.com staff will also be at hand to answer all your Camino-related questions. All participants will have a chance to enter our draw for 2 nights for two people in Santiago de Compostela and we’ll also have a Photography competition with fabulous prizes for the best pictures of the day sharing the #caminofestirl hashtag on Facebook, Twitter, Instagram or Pinterest. 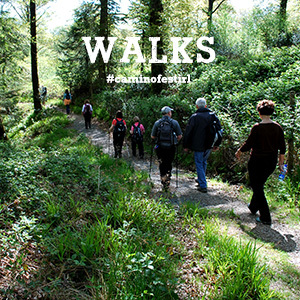 Here’s how to enter and all the prizes for our #caminofestirl Photography competition. Keep tuned for the latest updates on the CaminoWays.com Facebook Page! Read the preparation tips and advice. Long walk departs at 9,30am, short walks depart at 10,30am from basecamp. 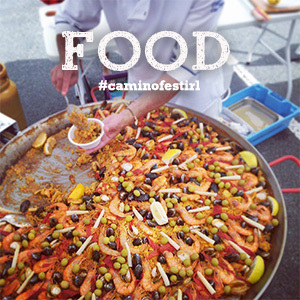 Ticket includes parking, guided walks, paella with FoodFiesta.ie and other activities. We recommend you bring some water and snacks, particularly for the long walk. Contact us to get your ticket at a reduced rate and make sure to wear your charity’s t-shirt on the day! Other groups and charities taking part: CRY, Focus Ireland, Diabetes Ireland and Ballyboden Walking Group. I was hoping that we could come to the family fun walk tomorrow. Only heard about it today we are two adults and four children… Is it completely sold out? Hi. Silly me! Since I read about this event on last sundays newspaper, ive been looking forward to it. I even changed plans so that I could go along!It never dawned on me that I would need to book! Is it possible to book at this stage? Hello, I did the first 150km of camino in April and would really like to do the 14k walk for CRY tomorrow. Can you let me now if it’s possible? I believe a member of the team has been in touch. See you on Sunday. Hi Leona, I’ve just sent you an email. I would love to join the Long Walk, 14k on Sunday. If you have two extra places could you let me know please. The 4K would not really be a challenge for us. I am sorry I did’nt book early, but we were trying to clear the day to walk. The long walk for the walking festival is a mountain trail so if you are used to walking with poles, please bring them along. You can find directions on how to get to Lough Dan here: https://www.facebook.com/events/1503263453225935/. It should be a good day out! Looking into the 14k walk,would i need My poles,Is it mountainous or flat terrain ?